I’ve had a bit of revelation in the past month or two. I’d realized that proper and sufficient hydration is truly one of the key factors to heal most skin problems. My skin troubles these days are dry skin, slightly enlarged pores, occasional breakouts and pigmentation; all of which also result in dull skin. I was on an anti-aging skincare regime, and then on a whitening skincare regime… and they were only treating one problem or the other, and when one problem was treated, another flared up. I got fed up. So, I went back to the most basic of all skincare regimes – simply keeping my skin well hydrated. And to my surprise, I started seeing results. After about 2 months, my skin texture has improved, its stopped looking and feeling dry, pigmentation is a little less obvious and pores are smaller. I am also loving the Kiehl’s Dermatologist Solutions Powerful Strength Line Reducing Concentrate for lines (I gotta rave at you another time) hence I will not comment on the line reduction (and there was). I do believe however that keeping skin well hydrated will also help with any problems with fine lines. Here’s what I’d been doing for my skin. We can’t just depend on creams and moisturizers to hydrate our skin. We need to hydrate from inside out and here’s where water comes in. During this time I was running my experiment, we were experiencing a heatwave here, and I was feeling under the weather. So I was consuming quite a lot of water regularly. More than the requisite 8 glasses a day (I personally think I need more than 8 glasses to be well hydrated). It helped hydrate my body from the inside and prevent too much moisture loss in the dry hot air and the dry air-conditioning environment. I say plain water because that’s really the best. Drinks with sugar or caffeine don’t count as they can further dehydrate your skin. Serums are much lighter in texture and absorbs more quickly into the skin and a good serum will penetrate the skin more effectively. 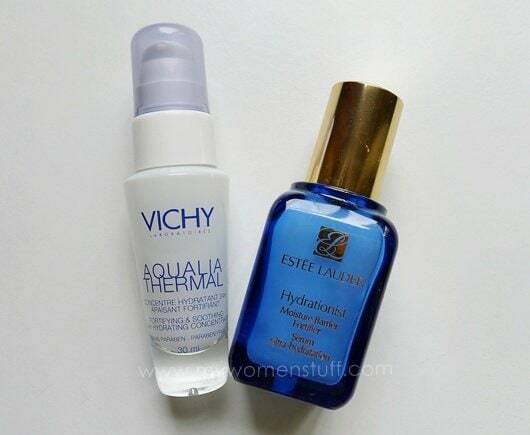 I was using a hydrating serum (Estee Lauder Hydrationist or Vichy Aqualia serum) in the day under my moisturizer, and at night, I was using either serums or Kiehl’s Midnight Recovery Concentrate. I find that using a hydrating serum helps boost my skin moisture level and helps my skin hold and retain moisture better too. The thing about having slightly dry skin is that you are then handed all these heavy creams to address the dryness in the skin. I was using these creams, but the dryness was persisting. So on a whim, I set all my creams aside and went back to using a hydrating light gel cream which everyone will recommend for those with oily skin. Pish I say! Worked beautifully for me! 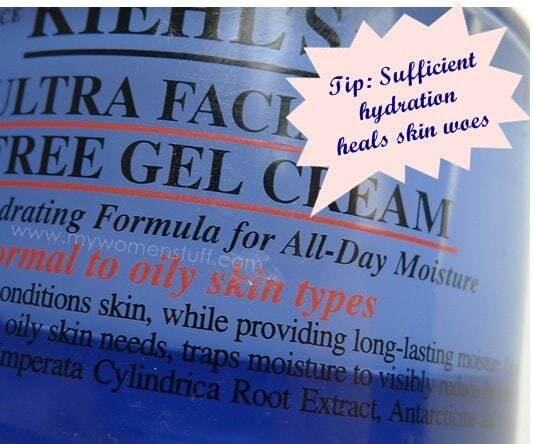 There are loads of such gel creams in the market – Biotherm Aquasource, Vichy Aqualia Thermal, Clinique Moisture Surge, H20+ Face Oasis and here’s one to look out for – Kiehl’s Ultra Facial Oil Free Gel Cream (coming soon in June/July 2011). All these are light on the skin and very hydrating so you can even use them as a quick mask. Layered over a hydrating serum, I find that they help my skin retain moisture better and therefore the skin looks more supple. Using a hydrating facial mask helps with intensive treatment. I like putting on a mask after exfoliating the skin and I use either a sheet mask or a cream based mask (like the Clarins Hydraquench mask or Vichy Aqualia Thermal cream masks) It helps intensify hydration and its also relaxing. If you are lazy, try a sleeping pack like the Laneige Water Sleeping Pack EX. Its a gel cream you apply and then go to sleep in so you don’t have to wash it off. A gel cream moisturizer works as a sleeping pack for me too. The 2 months of following this self created skin hydration regime delivered results. My skin looks much better and pores are less visible. Suddenly, foundation was slipping on without accentuating lines or flakiness or pores, and I didn’t have to use very much. I had a couple of spots, but kept at the moisturizing and they went away quite quickly without leaving any marks. Skin heals faster too, and pigmentation was less visible with my skin plumped up with moisture. I noticed this because I use less concealer. I walk around bare faced on weekends, and any redness in skin was reduced and it just looked markedly better. I was pleased as punch! oh yes! i’m focusing on hydration in recent months…tho going thru a recent bout of pimples thx to Biore sunscreen…my skin really does look better with smaller pores, ‘bouncy’ feel .. quite liking Garnier’s Aqua Gel Essence that you reviewed as a potential dupe to H20+’s Face Oasis… thx for the tip! Oh glad the Garnier works for you! 🙂 I finished up mine such a long time ago, but I didn’t replenish because I just prefered other ones. but i might end up getting Naruko products..not sure if you’ve heard of them…the guy from ‘???? ?‘ created this range of skincare that’s supposedly really good..looking to try the night gels…apparently they sell really well and are very affordable, like drugstore prices! Hey, excuse me for stepping into the conversation… Andrea I went to Taiwan last dec and I must tell u that taiwan’s skincare are really cheaper than here! U can try payeasy.com.. Buy ur things and pick them up at any 7-11. I envy how convinient the Taiwanese girls could buy their stuffs. That website is quite messy but u really can get value buys. Ps: am itching to try the red series too! I had the same recent revelation too and have been treating my skin with more hydration than before. My regime is quite similar to yours. My skin has improved quite a bit and does feel better too. It used to be very dry, flaky and uncomfortable. That’s great to know this intensive hydration is working for you too! 😀 I didn’t have flaky skin, but it was certainly dry and all those creams for dry skin just wasn’t helping very much. Totally agree with you on boosting our hydration level, which is the basic of everything. I had the same case as you. Moisturisers is insufficient for me, even intensive ones. Changed to oil, ocassionally use a hydrating serum beneath and do a weekly hydrating mask. Definately saw changes on my skin! However for 2-3 times a week, I tried my DIY mask using facial cottons soaked with Hada Labo Lotion and it worked beautifully for me! Skin is supple the morning after. Cheap and easy. Nice to know oil works for you 🙂 I haven’t tried using oil moisturizers yet and thanks for the Hada Labo quick mask tip! Great tips! 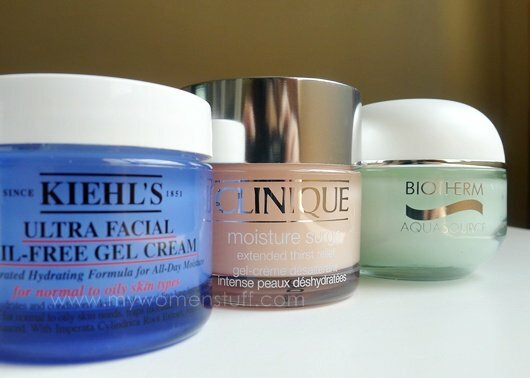 It’s true, each time I needed an instant “moist booster” I go for hydrating masks and you know how much I love Gel moisturizers! hydration is the key to everything! i use whitening serums instead of hydrating serums, as my skin isn’t that dry to begin with. oooh, i always had this question, moisturizing and hydrating, are both the same, or it’s different? i remember reading somewhere saying moisturizing is to put in “oil” into the skin, while hydrating is well, putting back “water” into the skin. what do you think? I’ll be honest, I don’t know 😛 But Viva Woman has an article on this that might help. Definitely in total agreement with all that you’ve said. My skin thrives far better on a daily dose of Clinique Moisture Surge! Thanks Ksuan 🙂 Rediscovering all my gel creams is making my skin so happy and toing toing! I remember I picked up a whole set of H20+ Face Oasis (including face wash and eye cream) in HK at the price of less than 1 tub locally! Its great stuff! How do you alternate between all these different range ie whitening, anti-aging etc? great post! in fact i’ve been switching to ‘hydro’ skincare almost 3 years now. never look back 🙂 my skin is oily/combi and none of the oil-free or any products that claim to improve my skin problems worked. but most of the SA did told me about hydration is important to combat skin oiliness .yet they never intro me to their full line of hydration products but direct me to their oil free stuff.so, i chosed my own line and went full force on concentrating to only address skin hydration. My SA told me that before .. but I wasn’t that convinced . After reading your post ; I am now going to hydrate my skin more !! Thanks for the post!! I’ve been trying out the gel creams lately…unfortunately I probably will go back to the cream ones, for the daytime at least. Gel creams have the tendency to react badly to the BB cream or foundation (as in causing the foundation to flake). This is such a good post! In a world where companies keep on dishing out so many products made to address each and every single concern out there, going back to hydration is really important. Thanks Paris! I go agree. The most basic of anything is always to get the skin hydrated, I learnt that a few years ago. I like to use a water sleeping mask and if you have a steam room at a gym, I tend to slap on some gel which has hyaluronic acid before heading in for about 10-15 mins, it works a charm! It doesnt work in a sauna room though as a sauna is dry heat! You’re welcome Jo! I hope these help you and your skin! But stress is always awful for skin so I hope your stressful period ends soon. Agree with the hydration theme! Ahh… All this talk about Naruko! I have to take a look! Enablers everyone!